Inflammation offers some benefits to the human body. It fights infection and improves the healing process, as noted by the University of Wisconsin Integrative Department of Family Medicine. However, if inflammation continues for a long period of time, or becomes chronic, it can lead to injury. Inflammation has been associated with asthma, cancer, type 2 diabetes, stroke and heart disease. Diseases in which the body attacks itself, as with lupus and rheumatoid arthritis, are also associated with inflammation. Some foods cause extra inflammation, so a change of eating habits may improve your health. Certain fats, such as saturated and trans fat, have pro-inflammatory properties, according to the Cleveland Clinic. Processed foods like potato chips, doughnuts, crackers, or cookies are high in trans fats. Saturated fats are present in foods like whole milk dairy products and other animal products. When following an anti-inflammatory diet, you should avoid these foods. Omega-3 fatty acids fight inflammation in the body. Other fatty acids -- called the omega-6 acids -- are pro-inflammatory and tend to increase the production of higher numbers of inflammatory chemicals, as noted by the American Medical Student Association. High levels of omega-6 fatty acids also make it more difficult for your body to use the healthier omega-3 acids that may be present. The typical American diet contains abundant omega-6 acids, increasing the risk for inflammation. 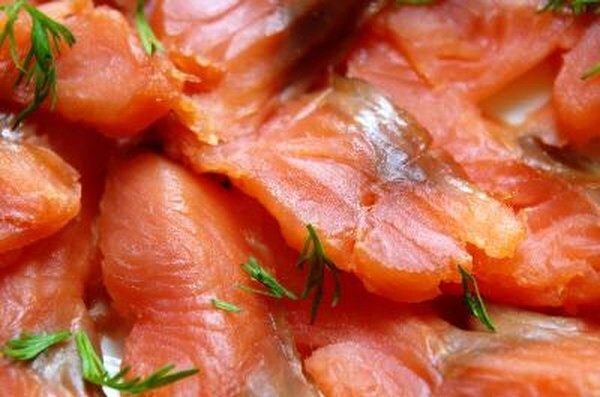 To increase your intake of of omega-3, eat more cold water fish, such as salmon, herring, or sardines. Other foods high in omega-3 include flax seeds, walnuts and leafy green vegetables. Red meats and processed oils, such as peanut, soy and corn oil, are high in omega-6 fats. Eating more fruits and vegetables may lower inflammation. They contain antioxidants, phytonutrients and fiber, which all help to decrease inflammation, as noted by the Sjögren’s Syndrome Foundation. Yellow and orange peppers, carrots, spinach, and citrus fruits are rich in antioxidants and phytonutrients. Increased fiber in the diet leads to regular bowel movements and helps eliminate waste products that may increase inflammation. You can also increase the fiber in your diet by adding flax seeds or eating more whole grains. Many herbs and spices have anti-inflammatory properties. For example, ginger has the same antioxidant power of vitamin C and may improve the symptoms of arthritis; cayenne may lower the formation of LDL or bad cholesterol, as noted on MyFoundationDiet.com. Other examples of anti-inflammatory herbs and spices are nutmeg, cloves, oregano and willow bark, according to University of Wisconsin Integrative Department of Family Medicine. Adding these herbs and spices to your foods may increase the antioxidant quotient and may reduce inflammation. Food allergies and intolerance reactions can all cause inflammation. By eliminating these foods from the diet, you may decrease these reactions. The foods that cause food allergies vary from person to person, but common offenders include dairy products, wheat, eggs and peanuts, according to the Sjögren’s Syndrome Foundation. Foods composed of simple carbohydrates can also cause inflammation. They have a high glycemic load and can cause drastic changes in your blood sugar levels and in the amount of insulin in the blood. These fluctuations also tend to increase inflammation, according to the University of Wisconsin Integrative Department of Family Medicine. Examples of simple carbohydrates include white breads, pastas, rice, cakes and corn syrups.